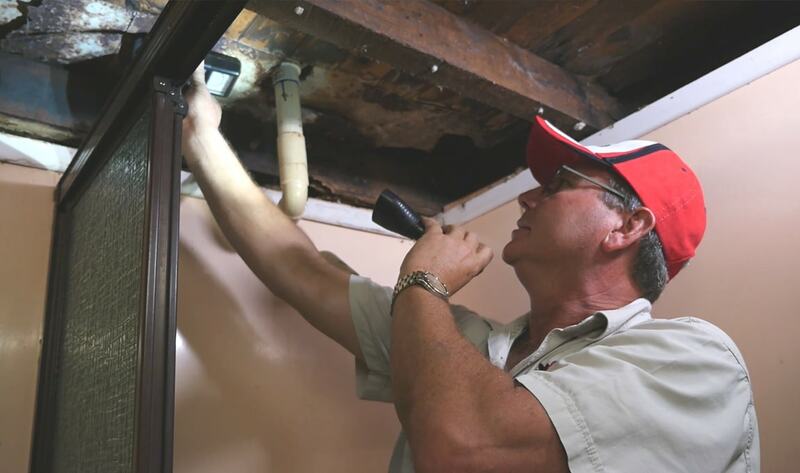 Greg from TKO Pest Management Cairns, explains how extensive termite damage will often be concealed by internal wall cladding and other visual obstructions. Areas associated with moisture inside your house (bathrooms and other ground-level rooms) can often become home to termite colonies that have breached your buildings external perimeter (read more about termites and structural moisture here). Once the internal wall cladding is removed from buildings containing active termites, it is easy to see the “termite leads” (tunnels made from mud that termites build and use as transport paths) and the extent of damage that the internal timber structures have incurred. In situations where there has been a leaking bath or shower, the primary concerns held by homeowners is usually water damage / fungal decay from the leak. It is important for Property owners, particularly up here in Cairns and Tropical North Queenland, to understand that this moisture will attract termites into these structures and the damage that can be caused as a result of the presence of termite will usually far outweigh that which can be caused by localised water damage to timber structures.